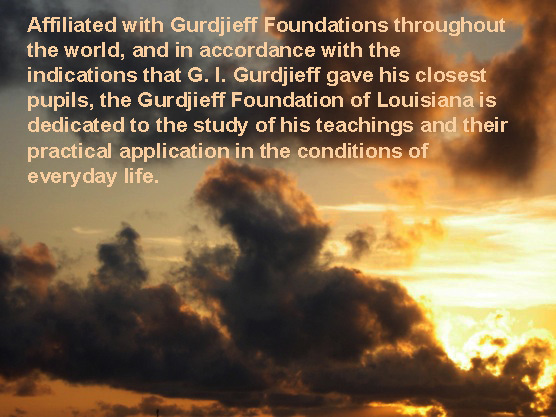 The Gurdjieff Foundation of Louisiana has been in existence in the greater New Orleans area since the late 1970s and is affiliated with the Gurdjieff Foundation of New York. The group comes together on a weekly basis for guided sittings, meetings, work days and movements classes, both in New Orleans and on the North Shore of Lake Pontchartrain. Preparatory groups are also available on a weekly basis in both locations and are open to those who have made an initial contact through email (zoukini@aol.com) or by phone at (985)502-6582. All are invited to participate.